Along the many curves of Old Taylor Road in front of Faulkner Flats apartments rests one of Oxford’s most popular coffee shops. Formerly located on The Square, High Point Coffee has remained a town favorite since 2009 when Joel Edlin bought the brand. Edlin stands by the idea that a cup of high-quality coffee is the focal point of High Point’s roasting process, and as a wholesale distributer, consistency of flavor also plays a major role. Having grown up around those in the food industry, Edlin followed suit and developed a 20-year love-affair with roasting coffee. High Point Coffee’s newest location is on Old Taylor Road, on the other side of Lapels Dry Cleaning. Photo by Rachel DePaolo. “Fulfillment comes from having less stress, enjoying life, and doing a good job. I want a really good product that people can relate to and like,” he said. Edlin recalls being ecstatic when he discovered the previous owners of High Point Coffee were selling the brand in 2009. He and a partner purchased the brand, and in 2015 he took over as full owner. He continued to develop strong relationships with licensed stores and wholesale clients nationwide, as well as the local community. In August 2018, High Point Coffee opened its doors on Old Taylor Road to provide a place for all coffee lovers. “I make sure it’s a good place for people to work and a good environment for the customers,” Edlin said. The new store has study rooms for students and customers which include desks, chairs, white boards, and soon-to-be printing services. The high-quality coffee and homegrown aesthetic that High Point embodies begins at the roasting facility on Highway 7. Roasting coffee is more than pressing one button and leaving for the day. Just like people rise at first light, coffee rises at ‘first crack’. In the mindset of quality, Edlin removes all auto-roasting procedures and makes sure he is constantly monitoring the temperatures, gas valve, fan, and overall bean temperature. “We try to concentrate on small batch toasting, and that’s what we continue to do. My roaster is 23 kilos—a 40 pounds roaster. A half batch is 20 pounds and I found out that the better quality is at half capacity,” he said. 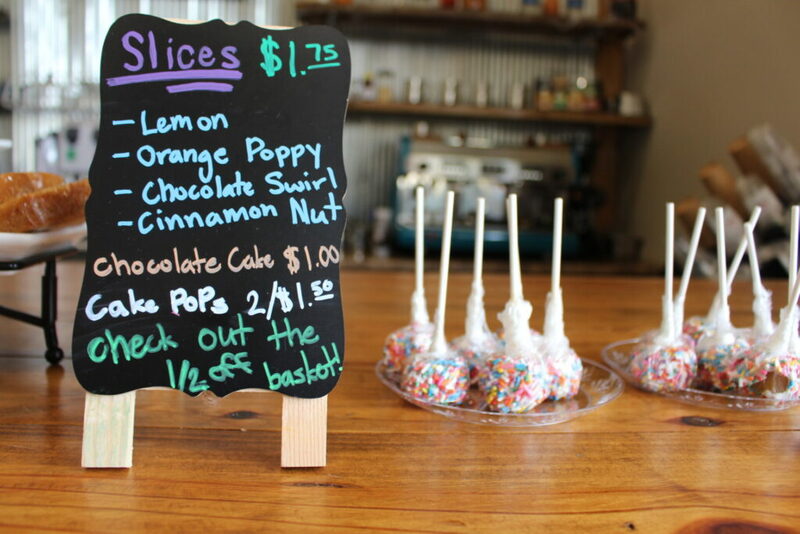 High Point Coffee also offers treats like muffins, cake and cake pops to complement a hot or cold cup coffee. Photo by Jordan Hoecherl. The beans come from more than 13 countries and have various points of entry in the U.S. including Edlin’s personal favorite, New Orleans. The beans come from regions where high altitude meets tropical soil. These import locations usually follow the equator around the globe and include coffee like Monsoon Malabar from India. “The highest point is typically where (beans) grow the best, hence the name High Point Coffee,” Edlin said. The initial coffee bean looks like nothing more than a small peanut, but roasting transforms it into a mocha-colored bean with an aroma that will engulf any room. To create the flavor, the first step of the roasting process is to pre-heat the roaster. Without revealing trade secrets, the roaster usually preheats to 335 degrees Fahrenheit and then increases or decreases depending on the roast. To create a blonde roast, also referred to as a City roast, the first crack of the bean is inside the roaster within nine to 10 minutes. For darker roasts, the next few cracks may be within the roaster or during the cooling process. This attention to the bean allows High Point to keep a consistent taste, and enables Edlin to hand select every batch to ensure the highest quality. Once the beans are cooled there is work to be done in regard to packaging. Edlin said he finds pleasure in hand-stamping each retail bag and believes that this personal touch enables him to connect with the customers.